Young elephants are snatched from their forest homes to supply tourist attractions and festivals. Capture from the wild often entails slaughtering the mothers and other herd members who attempt to protect their young. The captured calves are isolated and then forced into a pen and tied with ropes to prevent them moving. They are deprived of water, food and sleep. Terrified, they are brutally, often fatally, beaten with rods, chains or bullhooks (a rod with sharp metal hooks at the striking end) and stabbed with knives and nails. This practice – “pajan” – is designed to break their spirits and brutalise them into submission. So ruthless are the beatings that 50% or more die during this ‘domestication’ process. For nearly all captive elephants, life involves great pain, fear, dehydration, malnutrition, abuse and suffering. Most spend virtually all their lives chained tightly to concrete posts. This causes deep wounds and infections. The chains often contain many sharp hooks that dig into the flesh. They are often kept in solitary confinement. Complete obedience is enforced by the constant use of the bullhook rod (or “ankus”) to jab or strike the elephant. The placing of the bullhook on the elephants foot is enough to keep it in fear for hours. It associated the rod with the ruthless beating it has undergone. Woe betide if the rod slips off the foot. The elephants’ tusks are blunted by removing the ends with chainsaws, a stressful and terrifying experience for the creature. In logging operations they are brutally beaten to drive them to haul heavy loads. All these ruthless practices including pajan itself are routinely denied by officials and others with vested interests. Most holidaymakers are unaware that many elephants have been captured from the wild and that a brutal process of fear and pain has taken place to train them to accept a rider on their back or a paintbrush in their trunks. Despite their enormous size, elephants’ backs are surprisingly fragile. Ignoring this, tourism camps often strap a heavy metal chair onto their backs, allowing up to four people to sit in it. Exhausted elephants are often simply beaten into continuing. Elephant exhibiting pain through bearing excessive weight. Baby elephant being “disciplined” by beating in front of its parent (the widespread practice of pajan). Many captive elephants are used for religious ceremonies and rented out for festivals. Most of the Hindu and other temples in India and beyond own elephants; the Guruvayoor temple in Kerala (south-west India) has around 60. Many temples keep elephants to give blessings to visitors, for which a fee is paid. They are transported between events at speed in flatback trucks, out of which they can fall to their deaths. Surrounded by crowds and noise, the animals are often chained by their legs to posts. Very often two legs are tethered in opposite directions, severely restricting movement and preventing them from even turning round. Injuries are left unattended. Elephants suffer from heat exhaustion and, as a result of standing on the hard stone temple floors, from foot diseases that wear away the soles of the feet, the pain aggravated by infections from having to stand for days in their own waste. Few have protection from the sun, being unable to bathe when they wish or cover themselves in dirt to cool their skin as they naturally would. 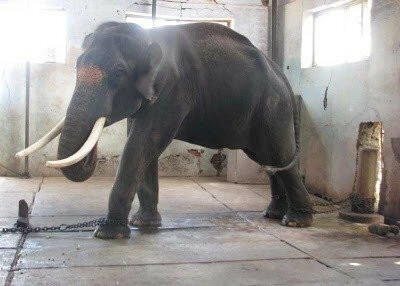 Captive elephants suffer regular injuries and illnesses but rarely receive any veterinary intervention, despite the considerable sums their exploitation earns for their owners. December to May is festival season in much of India and south east Asia, and is a booming time for elephant owners; some rent their animals out for thousands of dollars a day. Kerala alone has 10,000 festivals where elephants are painted, adorned in rich heavy garments and flashing lights, carry temple deities, and parade in noisy and crowded streets. Carrying up to 800kg on their back – the deity, its frame and up to four men – they usually have all four legs shackled, standing still for hours at a time. Parades are long and noisy with firecrackers being set off and public announcement systems blaring out. Elephants may attend hundreds of festivals throughout the season. They are forced to walk to the next venue on tarred roads in the scorching sun or are strapped into dilapidated vehicles for the journey between each one. The Wildlife Protection Society of India reports the loss of over 121 elephants due to poaching in the period 2008-2011. Loss and fragmentation of habitat are major threats for wild elephants. The rapidly growing human population of tropical Asia has encroached on the elephant’s dwindling forest habitat. Expanding human settlements and farming as well as industrial operations and roads have eaten into and fragmented elephant habitats and blocked their traditional migratory routes, known as “corridors”. This gives rise to human-elephant conflict. With food and space diminishing, elephants stray onto farmland to raid crops, bringing them increasingly into conflict with people. Both people and elephants are killed in such conflicts; farmers retaliate by poisoning or shooting elephants. Also each year elephants are killed in rail and road accidents and by electrocution following contact with unprotected electric power lines that run through their habitat.